Iceland is a landscape photographer’s playground. Its variety of dramatic landscapes packed into a relatively small area makes Iceland a country that boasts many great photo locations. While some of these locations are inaccessible without a 4×4 vehicle, there are still many Iceland photo locations that you can easily get to with a 2-wheel drive car, especially during the summer. While the focus of this article is on visiting Iceland during the summer, not all summer in Iceland is created equal. My personal preference is to visit Iceland in late May or early June for several reasons. First off, while there is absolutely no guarantee of dry weather during a trip to Iceland (and if I were a gambling man I would put my money on it raining during your time there), May and June are, on average, the driest months of the year. This means you’ll have the best chance of actually seeing the things you traveled to Iceland to see. Temperatures, like precipitation, can also greatly vary in Iceland during May and June, and tend to range anywhere from freezing up 60 degrees Fahrenheit. The second reason to make your trip to Iceland during May or early June is the prices. 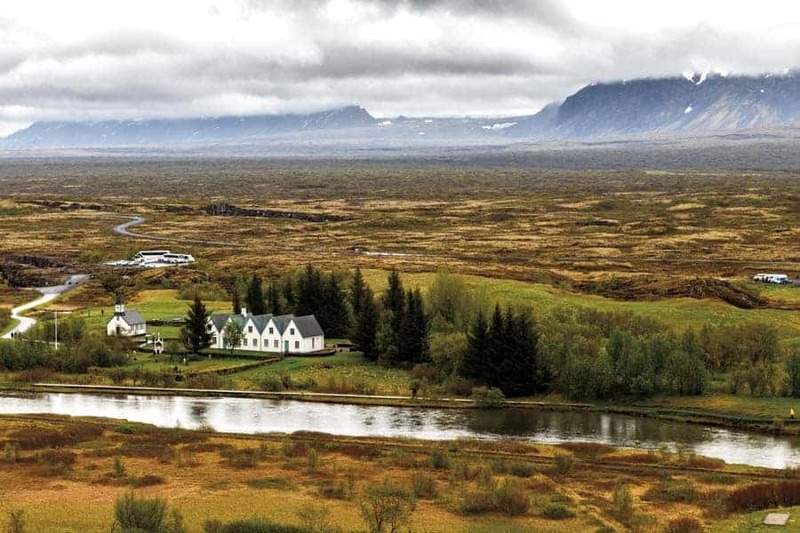 In a country like Iceland that has a large spike in tourism during the summer months, traveling in May or early June gets you into the country before the busy season. Due to this, there will be fewer tourists at the popular locations to walk in front of your camera with that blissful ignorance of your presence that makes us tear our hair out, and prices will be significantly less outside of peak tourism season, which tends to begin either June 1st or June 15th depending on the vendor. I once tried to book a room in a hostel in Reykjavík in the first and last days of the trip. The first day, which was during off-season for tourism, was around $20. Four days later on June 1st that price spiked to around $50. 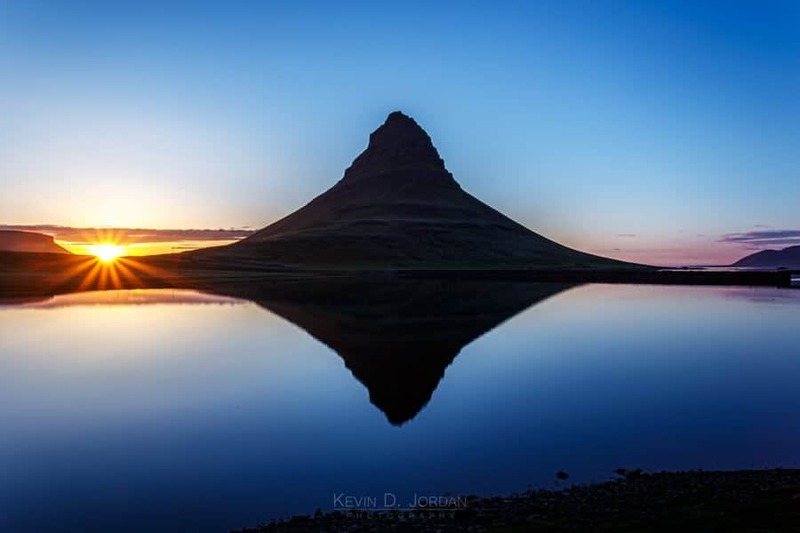 The last and most important reason to travel to Iceland during late May and early June is to take advantage of the spectacular light provided by the midnight sun. During this time of year, the sun never fully sets in the northernmost parts of the country, and only briefly sets in the south. This means hours of perfect sunset and golden hour light to play with, which is a dream of many photographers. Traveling in May and June means that winter attractions like ice caves and the Northern Lights will not be possibilities, but the access you gain to large amounts of the country as the snow melts makes this time of year worthwhile. This article is somewhat obsolete now. Since posting this article a year ago, we released an iPhone/iPad app of all the best places to photograph in Iceland (and around the world). It' s a free app called Really Good Photo Spots and you can download it right here. The app has Iceland REALLY well covered with over 100 spots to photograph. The app is essential for photographing Iceland because you can just tap “Spots near me” at any time while out shooting and BOOM! You see all the best spots to take pictures near there. It's pretty cool. The only limitation is that you may not have internet on your phone in many spots in Iceland. The app is free, but you have to pay a few dollars to be able to use the data off-line. Small price to pay for something that could really improve your trip. While there are several smaller airports around Iceland, Keflavik International Airport, which is about a 40 minute drive from the capital city of Reykjavík, is where most international flights travel in and out of. Akureyri Airport in the northern part of Iceland also takes international flights, but is less centrally located that Keflavik. From Keflavik, you can either rent a car or catch the bus to Reykjavík to continue your trip. Guided tours are plentiful in Iceland, but most are not photography-specific, do not take you to locations during the best light, and often do not plan to have you at any one location long enough to explore different shots. Cycling is also a possible option for transport, but could undoubtedly get a bit dicey during the regular bouts of bad weather Iceland experiences. For the purpose of this photo guide, traveling around by car will be the way to go; specifically, a car that does not have four-wheel drive. When traveling around Iceland via car, there are a few important things to know. Most importantly, keep in mind that not all roads are passable with a two-wheel drive vehicle. Roads that are meant to be traveled by 4×4 only will have an “F” in front of the route number (i.e. F260). Other roads are unpaved, hard-packed gravel, which do not have vehicle restrictions, but are often riddled with potholes that can make travel on them much slower than expected. Iceland’s Ring Road (Route 1) is fully paved in most sections and is the best way to access many of the locations in this guide. The Ring Road travels in a circle around the mainland of the country and is considered one of the best road trips in the world. If you are renting a car in Iceland, pay close attention to the rental agreement before you sign, as two-wheel drive vehicles are often prohibited from several other non-F-roads, and insurance policies have various caveats that may not cover damage caused by gravel or animals, or damage to tires or the undercarriage of the vehicle. That caveat about animals may sound strange, but you will see sheep in the road. Stay alert and be careful while driving out there. Like any other place, Iceland is a place that should be explored. If you can, take your time wandering, get off of the beaten paths, and find your own new spots and angles to photograph. For those who have limited time in the country or who want to pack as many photogenic locations into their trip as possible, the following Iceland photo locations will give you a great chance at seeing some of the best views the country has to offer and hopefully to come home with a great batch of new images. Iceland is such a vast photographer’s playground, however, that this location list is by no means comprehensive. Reykjavík is the capital city of Iceland and the easiest place in the country to access. Home to about 40% of Iceland’s approximately 332,000 residents, Reykjavík gives as much of a city feel as you will find in Iceland. The city is serviced by a bus system, and the downtown area is small and extremely walkable. For those who do not plan to rent a car during their time in Iceland, or want to avoid paying for one for a day or two, Reykjavík can easily be experienced without a vehicle. Hallgrímskirkja, a church near the city center, provides one of the most impressive views in Reykjavík. 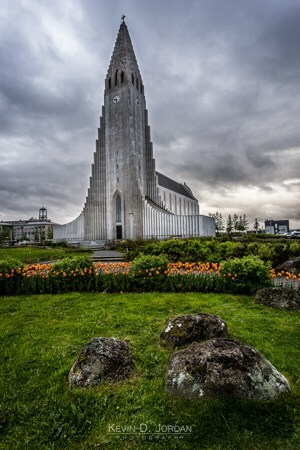 The church stands approximately 240 feet tall and its design was inspired by the volcanic basalt columns that are common to Iceland. A statue of Leif Eriksson stands in front of the church and can be used as a foreground object to add even more interest to a shot of the church. On good weather days, take the elevator to the top of the clock tower in Hallgrímskirkja for unmatched views of the surrounding city. Due to the size of Hallgrímskirkja, an ultra wide angle lens is a good accessory to have with you for a shot of the church. The shot here was taken at 17mm on a full frame camera. 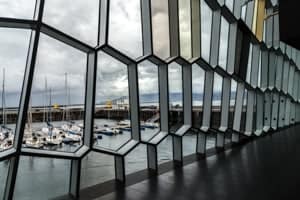 Another impressive but very different architectural wonder in Reykjavík is the concert hall Harpa. The geometric glass panes that make up its exterior make for a wealth of photo opportunities that change as the lighting does. If you can, try to visit Harpa at a few different times of day (and night) to see it in different light. The building makes for a great wide angle shot, but should be explored at all focal lengths, inside and out. The Sun Voyager is an iconic stainless steel statue located along Saebraut on Reykjavík’s waterfront between Harpa and Hallgrimskirkja. 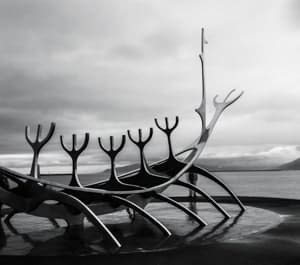 Completed in 1990, this statue can be easily overlooked if you don’t know where to find it, but provides another uniquely modern-looking structure that contrasts well with Iceland’s surrounding landscapes. The statue often finds its way onto local postcards because of the famous Mount Esja that looms in the background of many photos of the statue. The Sun Voyager is another location where you can play around with different focal lengths and lighting situations for a unique photo. For the iconic view of the statue with the mountains in the background, a focal length of about 24 to 30mm on a full frame camera should be wide enough to keep the statue in the frame while also not dwarfing Mount Esja in the distance. 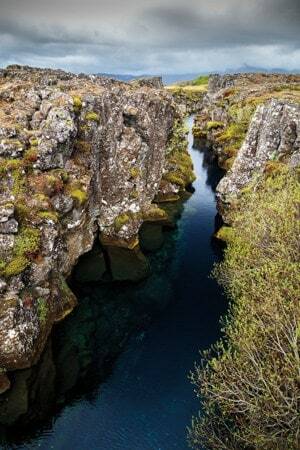 Thingvellir is a national park in southwestern Iceland and one of the three stops on the famous Golden Circle tour. The main attractions of the park from a photographic standpoint are the notable geology of the park, as well as the founding location of Iceland’s parliament. Great views of the park come from an overlook near the information center, which give a bird’s eye view of the iconic Thingvellir church and surrounding landscape. This viewpoint gives a great opportunity for panoramas, as well as a shot juxtaposing the church with the mountains in the background. A wide angle lens really isn’t necessary from this overlook, as you will most likely want to zoom in a bit in order to get a good composition of the landscape below you. Due to Thingvellir’s location at the intersection of the North American and Eurasian tectonic plates (like much of Iceland), there is some very interesting geology to be seen there. The main attraction is Silfra, a fissure lake that is located in a rift between the two plates, meaning that divers who make their way into the lake are swimming between two continents. The lake is fed by glacial melt water that is filtered through volcanic rock during the 30+ years it takes to reach the lake, meaning that the water is impeccably clear and absolutely delicious (no, seriously, you can drink it). This high underwater visibility coupled with the geologic formations in the fissure make Silfra one of the top cold water dives in the world, so those with diving experience and an underwater housing for their camera may want to consider taking a dip into Silfra’s near-freezing waters. Although I didn’t have the experience necessary for a dive when I was there, I snorkeled through Silfra and can confirm it’s a pretty great experience. For those who won’t make it into the water, the views running along the surface of the lake are still very unique and photogenic. Thingvellir is located just east of Reykjavík, about a 40 minute drive from downtown. Gullfoss is a large waterfall in southwestern Iceland and another stop on the Golden Circle tour. Compared to Thingvellir, there is a bit less room to wander at Gullfoss, so the crowds from tour buses will be far more noticeable here. The falls has two main drops totaling 105 feet, and can yield a great photo at wide angles from a high vantage point or up close from one of the trails leading down towards the side of the falls. Unless you are looking to document how crowded a spot on the Golden Circle can get, try to visit Gullfoss on off hours when tour buses won’t be stopping there. The waterfall is about a 90 minute drive from downtown Reykjavík. 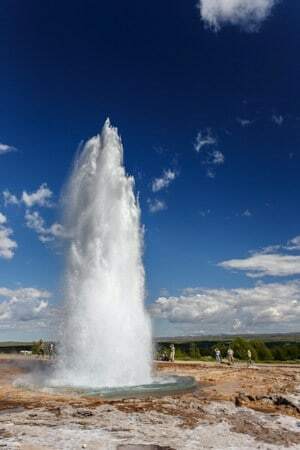 The last stop on the Golden Circle tour is Geysir, the geyser that geysers were named after… Geysir reportedly has not erupted regularly since 1916, and is believed to be dormant now. Another geyser, Strokkur, is also located in the same area, and erupts every 6 to 10 minutes with regularity. This geyser is where throngs of tourists gather to see the eruptions of water about 50 to 60 feet in the air. While I have never been to Yellowstone National Park, I’ve overheard plenty of tourists at Strokkur say that if you have seen Old Faithful erupt, there is no need to go to the less impressive Strokkur. However, for those who have not been to Yellowstone, Strokkur’s eruptions make for a cool experience and interesting photos, especially if you can time them just as the surface tension of the water is broken at the beginning of an eruption. Most standard walkaround or kit lenses will do to capture photos of a Strokkur eruption. However, just as with Gullfoss, the best time to visit the geyser is outside of prime tourist hours. Geysir in particular is overloaded during a summer day, so going there is a treat at the end of a trip around Iceland because it serves as a reminder of how lucky you were to see so many other beautiful landscapes without swarms of people joining you. Geysir is another easy day trip from Reykjavík with a drive time of about 80 minutes from downtown. 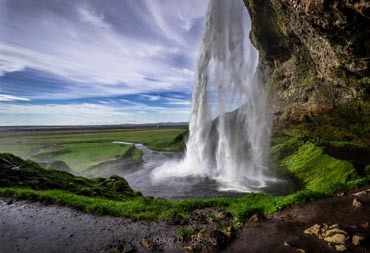 Seljalandsfoss is arguably the most iconic waterfall in Iceland, and a must-visit due to its accessible location just off of the Ring Road and Route 249. The waterfall drops 200 feet into a pool and has a pathway that leads around the backside of the falls, making it a waterfall that allows for many different photographic angles. The toughest part of photographing Seljalandsfoss is the intense spray that blows in curtains off the falls. To get the shot above, I set up my tripod; set my aperture, ISO, and shutter speed on an educated guess; set my focus to infinity; and took off my lens cap only long enough to take a shot. After evaluating how the exposure and framing turned out, I would tweak slightly in preparation of another quick removal of the lens cap and snap of the shutter. An ultra-wide lens is a good idea for Seljalandsfoss due to its scale and how close you can get to it, especially if you want to get a shot of the whole falls from directly behind it. In addition, consider taking something to cover your camera to protect from the spray and multiple lens cloths to deal with water droplets on your front lens element. For a less crowded waterfall that tends not to get as much attention as Seljalandsfoss, take a stroll down the dirt path parallel to the cliffs towards Gljúfrafoss, another tall waterfall that is partially obscured by the surrounding cliffs. Those who walk between the cliff walls can get another up-close, spectacular waterfall view with just as much water spray, but far less tourists. 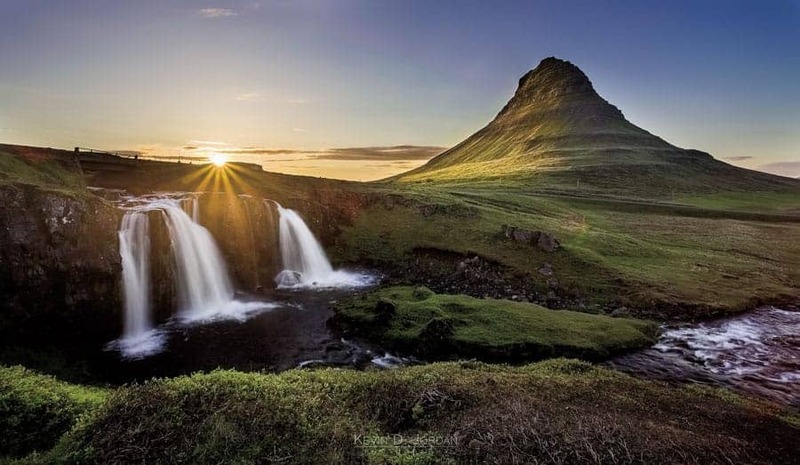 Seljalandsfoss and Gljúfrafoss are located just off Route 249 and the Ring Road about 90 minutes from Reykjavik in the southern portion of the country. A rainy day at Skogafoss. Yet another impressive, roadside waterfall, Skógafoss is located another 25-minute drive east down the Ring Road from Seljalandsfoss. 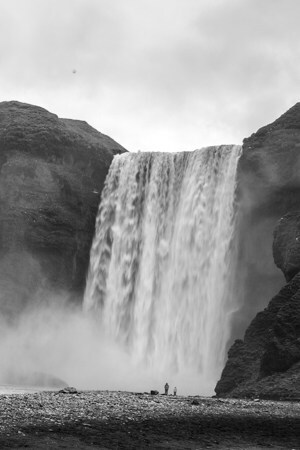 Skógafoss is the same height as Seljalandsfoss at about 200 feet, but seemingly dwarfs Seljalandsfoss due to its 82-foot width. Great views of the waterfall can be seen from the small river that leads up to its base. However, stairs located to the right of the waterfall lead up to various lookout points that give a bird’s eye view of the falls and the surrounding area. There are a few well-worn foot paths that lead from the stairs to the edge of the cliff adjacent to the waterfall, just keep in mind that if you decide to brave them, you will likely be walking on a combination of mud and wet grass caused by spray from the falls and frequent rainfall, so getting to close to the edge can be very dangerous. While I unfortunately have never been able to make it there myself, the parking turnoff for the famous Sólheimasandur plane wreckage is located about a ten minute drive east of Skogafoss. From the parking turnoff, the wreckage is about a 2.5-mile walk to the south. Be aware that driving on the beach is no longer allowed. Vík is a small town on the southern tip of Iceland that is home to about 300 people. The town serves as a quaint home base to several photogenic places along Iceland’s south coast, including Reynisfjara, Dyrhólaey, and the iconic church a hill overlooking the town. Reynisfjara and Dyrhólaey are large sea stacks located on opposite ends of a mile-long black sand beach just west of Vik. Reynisfjara is located on the eastern side of the beach near, while Dyrhólaey is located on the western end. Two separate roads lead to Reynisfjara and Dyrhólaey (Routes 215 and 218, respectively), which are each located about a 15 minute drive from Vík. While in Vík, don’t miss the church that overlooks the town, great views of which can be had from the Ring Road below. Given that you will be facing in a southerly direction to photograph them, both sea stacks are best visited either early or late in the day so you won’t be shooting into the sun. The end of the beach near Reynisfjara is a great place to sit and enjoy the beach during the day, however, due to the large basalt columns nearby that provide some alternate photo possibilities due to their characteristic geometric shapes. As you travel east on the Ring Road, you drive through a few sections of barren flood plains and flat areas once you get east of Vík. After driving through these somewhat non-photogenic areas, the Ring Road turns north towards Skaftafell National Park, which is home to the iconic waterfall Svartifoss and several glacial tongues. Before even reaching the park, the glacial tongues can easily been seen from miles away on the road. The photo above was taken from over a mile away from the glacial tongue, which itself is a mile wide. Any of the pull-offs along the road give excellent views of the glaciers. Be sure to have a telephoto lens with you to be able to have them prominent in your shots. Svartifoss, a skinny waterfall flanked by a wall of columnar basalt, is a main attraction of Skaftafell National Park. The hike to the falls is above a mile from the visitors’ center and is fairly easy. 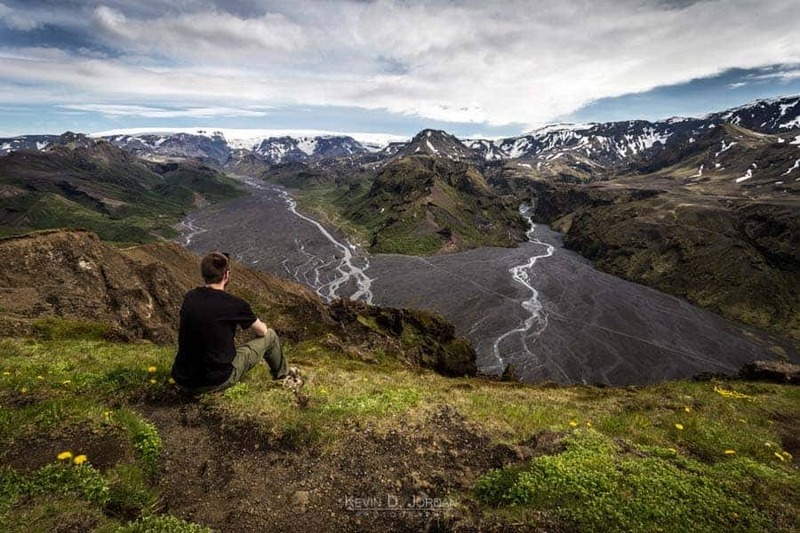 Another great view comes from a 2.3-mile round trip hike which ends near the Skaftafellsjökull glacial tongue and provides dramatic up-close views of the glacier. 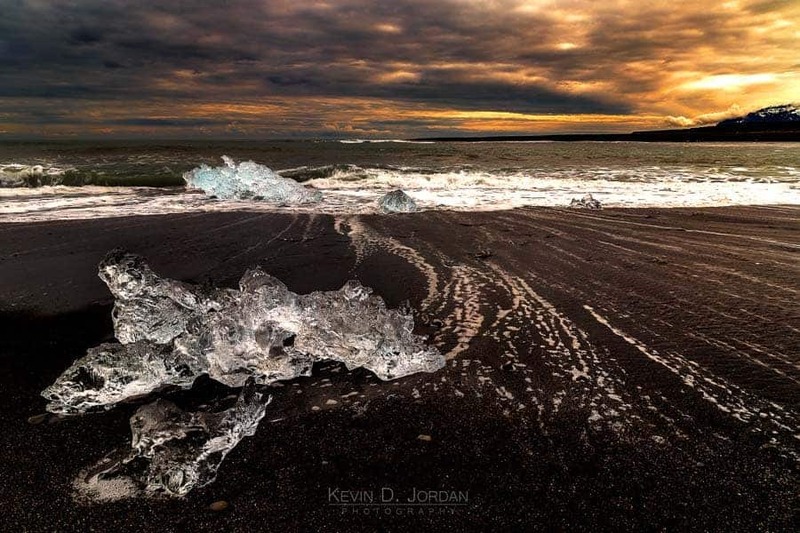 Although there are many great Iceland photography locations, Jökulsárlón is one that should not be missed. The glacial lagoon is located off of the Ring Road in southeastern Iceland and features floating icebergs which have broken off from Breiðamerkurjökull, the glacier which feeds the lagoon. The uniqueness of Jökulsárlón makes it worth visiting in any light, but prime times will be from evening until morning when you will have soft light and a lack of tourists. 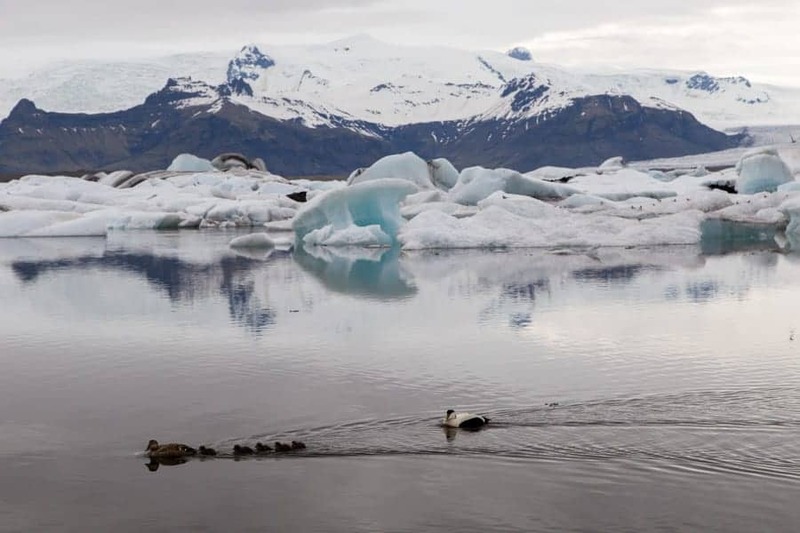 For an up-close view of the icebergs, boat tours are offered which zig-zag between the huge chunks of ice, which tend to collect closer towards the channel that connects the lagoon to the Atlantic Ocean. While the glacial lagoon is iconic, so is the black sand beach on the southern side of the Ring Road nearby. This is the beach where you have undoubtedly seen countless photos of chunks of ice strewn across the sand, not unlike the one above. After passing through the channel, many of the pieces of ice wash back onshore, making for bucket-list photo opportunities and just a really unique experience. Where the beach faces south, try not to stop by the beach at midday since you will be shooting into the sun. Situated at the southeastern tip of Iceland, Stoksness and Vetrahorn provide another iconic Iceland view. The Stoksness area is located approximately 10 km east of Höfn, the access road for which is located off of the Ring Road. The area provides a great number of compositions to play with, as black sand, low-lying mounds of vegetation, and beach textures in the foreground give way to the dramatic Vestrahorn mountain in the background. You will want to bring an ultra-wide lens with you to Stoksness, as it may take very wide focal lengths to get both your foreground and all of Vestrahorn in one shot. The East Fjords of Iceland are less of a single stop and more of a jaw-dropping stretch of the Ring Road. If you’re traveling around Iceland with someone else, the day you plan to travel through the East Fjords is the day you should convince them to take the wheel so that you can press your face against the car window the whole drive. The fjords are jagged, impressive, enormous, and other great adjectives as well. Enjoy your time driving through them, and stop wherever your heart desires to take photos. One note about a drive through the East Fjords is that the Ring Road turns to gravel for some of the trip through the fjords, so traveling will be slower than expected as your drive through. If you need to take a short cut and go north like I did when I was driving through, Route 939 climbs up and out of the fjords and provides excellent views along the way. The photo above is from the base of Route 939. The Mývatn region of Iceland is located about an hour drive east of Akureyri, a city in northern Iceland. The dominant feature of Mývatn is the namesake lake that resides there, but the most photogenic spots are located just east of the lake. Hverir is a geothermal area located east of Mývatn just off the Ring Road. Hverir is a place that looks like you might be on a different planet and smells like someone left 1,000 eggs out in the hot sun for weeks. 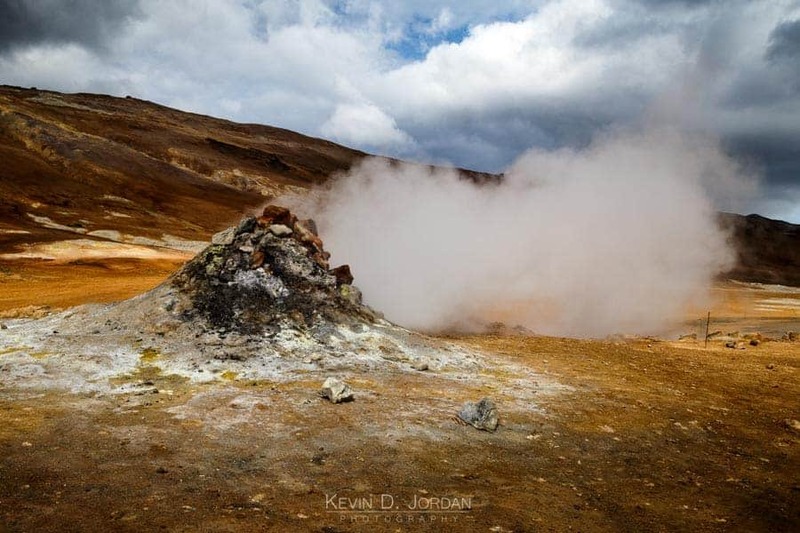 The bubbling mud pots and steam-spewing fumaroles provide endless photographic opportunities, so a wide angle and a telephoto are both good things to carry in your bag. Be careful to stay on paths in this area, as some spots simply have boiling water and mud spilling out of the ground. Hverir is a popular tourist spot, so avoiding prime daytime hours will avoid you having throngs of tourists take over your photos. Going when you have a cold also might be advisable, because then you at least won’t have to smell the sulfur leaking from the ground all around you. Even if your nostrils are free and clear, however, the views and resulting photos are completely worth it. Hverfjall is a volcanic crater left by an eruption approximately 5,500 years ago and stands 1,300 feet at its tallest point. The crater stands a few minutes’ drive southwest of Hverir, and a short hike up it yields dramatic views of the inner portions of the crater and the surrounding landscape. 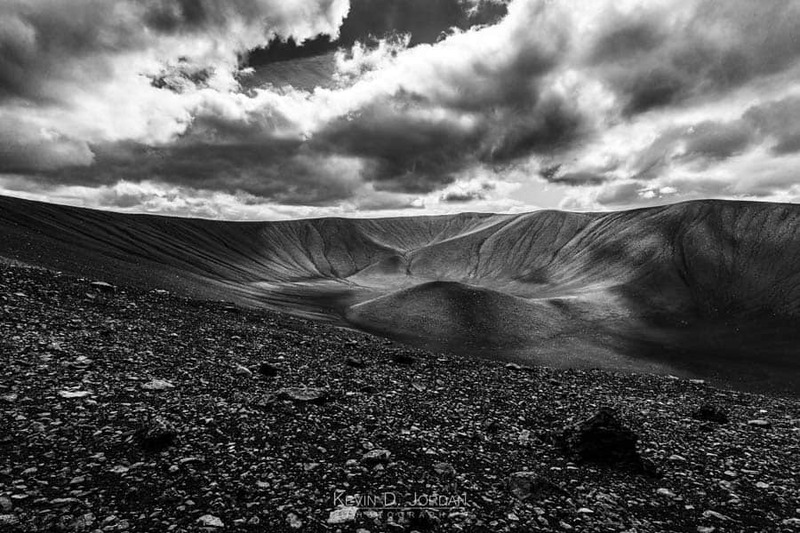 The crater is approximately 1 kilometer in diameter, the rim of which is accessible from one of two paths that start on the northwestern and southern sides of the crater. You will water an ultra-wide lens for views of the crater from the rim due to its size, but a telephoto might be a good idea to bring as well to get shots of the surrounding landscape. Hvítserkur is a picturesque sea stack located on the east side of the Vatnsenes Peninsula in northwestern Iceland. The sea stack is about a 90-minute roundtrip detour off the Ring Road, but the quiet beach and beautiful view is worth the trip. The sea stack is said to look like a dragon leaning over to drink water from the ocean. 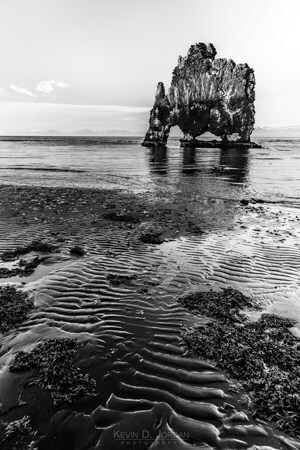 The sea stack is best viewed during low tide when the water recedes and you can catch great ripples and textures in the black sand. A focal length of about 24mm on a full frame camera will easily be able to get both the sea stack and a good foreground in a shot. However, bring a telephoto lens as well, since the area is also a popular spot for nesting birds and seals that float in with the current. To find Hvítserkur, drive up Route 711 from the Ring Road about 30 km (18.6 miles). The paths leading to the sea stack are located near the Osar Hostel on Route 711. Kirkjufell is one of the crown jewels of Iceland landscape photography. It is a unique mountain just outside of the small town of Grundarfjörður on the Snaefellsnes Peninsula in western Iceland, and is on the bucket list of many landscape photographers. While Kirkjufell looks great from many angles, the classic view is taken from Kirkjufellfoss, a triple waterfall located along a dirt road off of Route 54 west of Grundarfjörður. Since you will most likely be facing north when photographing Kirkjufell, you will never be shooting into a midday sun to try to get your photo. Best times for shooting Kirkjufell include the soft light before and after sunset (if it ever happens), especially when you can get the sun setting over Kirkjufellfoss. Bring an ultra-wide lens as anywhere from 14 to 17mm on a full-frame camera may be needed to get the falls and the mountain in the frame with a single shot, depending upon where you stand. Expect to see other photographers around when photographing at Kirkjufellfoss. It’s rare to have good light and a bucket list location all to yourself. And whether it’s crowded or not, try to experiment with different compositions while at Kirkjufell. The only thing better than getting your own shot from an iconic location is getting one you like that you haven’t seen before. I will openly admit that Thórsmörk is not accessible with a 2-wheel drive vehicle, but that isn’t going to stop me from finding some loopholes to include it in this guide. Thórsmörk is without a doubt one of the most beautiful places I have seen and I barely just scratched the surface of what it has to offer in the few hours I was able to visit there. Thórsmörk, while not accessible by 2-wheel drive car due to the river crossing required to get there by vehicle, can be accessed either by bus from Seljalandsfoss or from a hike that begins at Skogafoss. The Thórsmörk area is located inland to the north of these two waterfalls and to the north of the famous Eyjafjallajökull volcano that erupted in 2010. 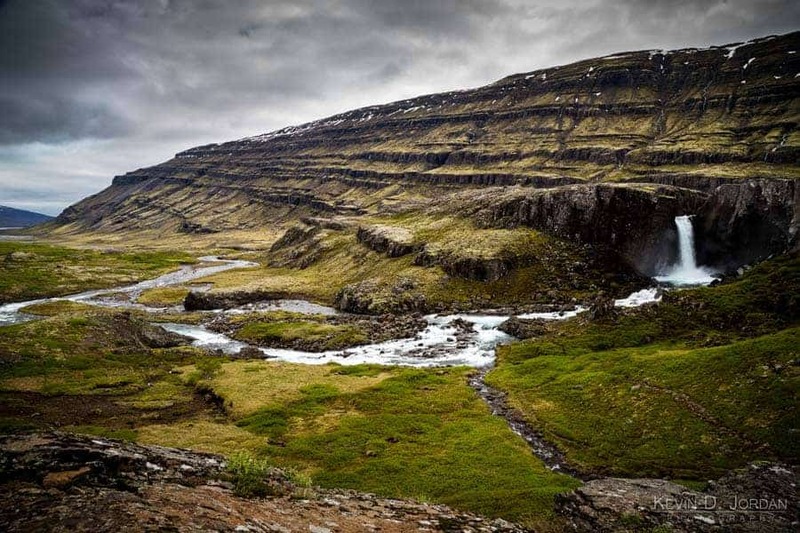 It is important to keep in mind, however, that if you do want to try to visit Thórsmörk, it typically doesn’t start to be accessible by bus until early June. Given that Iceland is such a gold mine for photographers, there are plenty more locations that didn’t make the cut for this guide. As a general rule of thumb, I noticed while traveling throughout the country that Icelandic towns tend to have very picturesque churches and you could definitely make a photo series strictly based on those buildings alone as you travel through each town. Below are a few more possible locations to keep in mind as your plan your trip through Iceland. And feel free to add your own favorites in the comments if they didn’t make the list here, but please limit the locations to those accessible with a two-wheel drive vehicle in the spirit of the article. Kevin D. Jordan is a landscape and night sky photographer based in Boston, Massachusetts. You can normally find him staying out all night chasing the Milky Way, capturing scenes around New England, and/or eating a truly gratuitous amount of pizza. You can follow his work on Facebook, on Instagram @kevindjordanphoto, and at www.kevindjordan.com.